Sunday UPDATE: He needed it and Matt Damon got it — barely. Crossing the $30M plateau for the first time since 2007's The Bourne Ultimatum, Damon's Elysium took home the top spot in a packed weekend at the multiplex. Neill Blomkamp's so-so follow-up to 2009's Oscar-nominated gem District 9 debuting at the low end of expectations but still better than a slew of tentpoles – The Lone Ranger, After Earth, R.I.P.D. – this summer. We're the Millers had a strong bow, nearly identical to the last Jen Aniston/Jason Sudeikis pairing, Horrible Bosses. And Disney's Planes did decent numbers for a project that was initially set to head directly to Walmart. We're stacked. After a couple of light-ish weekends, Hollywood rolls out four wide releases in an already packed-to-the-gills marketplace. Neill Blomkamp's follow-up to 2009's brilliant District 9, Elysium, is the clear frontrunner, though audiences savaged by this summer's onslaught of CGI spectacles may see it as more of the same and financially penalize it as such. 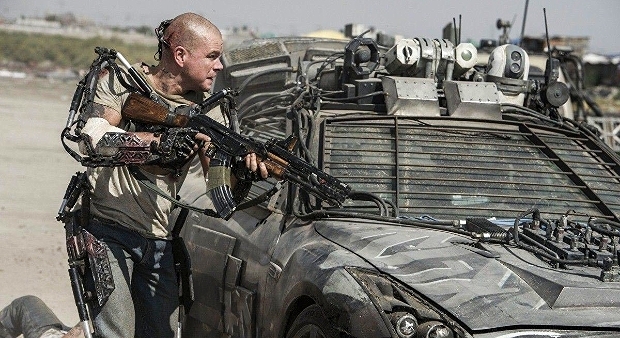 Elysium $32M - Matt Damon is in desperate need of a hit. Not since his final outing as Jason Bourne – some six years ago – has the Bostonian broken the $100M mark at the box office. His last outing, the fracking-fail Promised Land, deposited a diminutive $7.5M. Planes $24M - Produced as a direct-to-DVD project (the lackluster quality of its animation confirms that fact), the Mouse House decided to shift the Cars knockoff to a theatrical release and cash in ahead of the back-to-school dash. We're the Millers $22M - Those Horrible Bosses, Jennifer Aniston and Jason Sudeikis reteam for the R-rated road-trip laugher that bowed to a big $6.8M Wednesday. Percy Jackson: Sea of Monsters $19.5M - The middle-school set's mildly stoked for the bestselling book series' second cinematic chapter. 2 Guns $14M - The dynamic-duo actioner has performed more like a mid-September release than an early-August one.